Catholic Family Services offers many different types of groups and workshops. 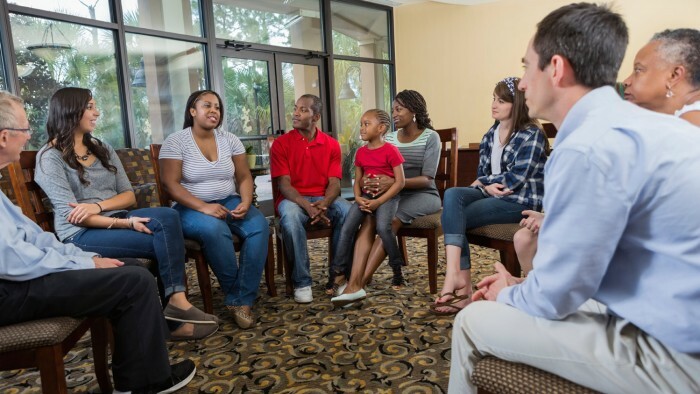 Clients of our agency use our groups as an adjunct service to Individual, Couple or Family counselling, or sometimes group work is a great starting place for some clients to build skills and lay foundational work. Group work isn’t for everyone. Some people find the thought of sharing with others scary or intimidating. Group work, however, does have many benefits and many clients find the experience rewarding and impactful. If you are processing whether or not a group might be the right fit for you, exploring some of the benefits below might be a great place to start. Group work can help clients to break down feelings of isolation. Sometimes we can get caught up in feeling as though we are the only people experiencing certain feelings, thoughts or circumstances. Interestingly, often times in group’s similar thoughts or themes emerge among members. Sitting in a space with people who can really relate to your situation can be helpful on your journey towards change. Other members of group counselling services often help you come up with specific ideas for improving a difficult situation or life challenge. In return, you are able to provide support and ideas to other members as well. As group members get more comfortable with one another and build alliances, these relationships will help to keep each member accountable in achieving their goals. Each week you attend group other members will check in and ask you questions about your successes and challenges. This check in process can help keep you on track. If a part of your goal is to work on how you interact with others, how you communicated or to build your listening skills group work is a great platform to practice! Group Work Can Help to Reshape Perspective. By listening to other members experiences we can build better self-awareness and insight. Go into a group making a commitment to keep an open mind. Sometimes trying new things can be overwhelming. Commit to seeing how things go and fill your mind with positive thoughts about how this experience could be helpful. Try sharing and see how that feels for you. Sharing and allowing yourself to be open and vulnerable is a vital piece in group work. Although it is not mandatory to share, it can be very impactful for an individual and the group. Try it out and see where it takes you! Many groups here at CFSSC require participants to complete home assignments. Keeping in touch with what you are learning in between sessions helps the content to really sink in. It will help you to use the concepts and learning from the group practically in your everyday life. Check out the groups and workshops section of our website for upcoming groups!